The Armorican Early Bronze age of north-western France is characterised by a hierarchical society, with classic groups of burial mounds similar to Wessex or Belgium. Settlements feature large houses, status symbols include daggers, halberds, and axes. Cremation cemeteries continue up to the Middle Bronze Age (Mordant 2013). South of the IJssel, the Hilversum tradition develops, with close connections with the Channel – North Sea region, showing pottery with cord-decorated necks and very marked rim-profiles (ca. 1850–1600 BC), until this is replaced by Drakenstein pottery, ornamented with fingernail-impressed cordons. Cremation started already in the Bell Beaker period, and becomes dominant during the MBA. After 1600 BC, a regional Hoogkarspel style develops west of the Delta (Fokkens and Fontijn 2013). Imported bronzes show a predominantly Atlantic origin. Deposits of weapons is common south of the Rhine, with swords preferentially deposited in major rivers and axes and spears in smaller bogs and streams in the near vicinity of settlements. This trend decreases drastically with the transition to the Early Iron Age, when deposition in Hallstatt chieftains’ graves becomes more common (Fokkens and Fontijn 2013). During the Middle Bronze Age, the Atlantic region shows the spread of the Deverel-Rimbury-type pottery. In the east, burial mounds become commonplace with the arrival of the Tumulus culture (pottery with excised decoration, pins, leg-rings), which spreads to the Paris Basin and the Loire Valley. Eventually, the Duffaits culture emerges from the Charente region to the Middle Loire, incorporating also Atlantic features (Mordant 2013). In the 14th century BC, a clear east–west cultural divide is established, with the Atlantic world showing new areas of metalwork and rich bronze hoards on both sides of the Channel, evidencing the continuity of hierarchical societies. There is an increase in cremation in its funeral customs alongside more traditional burials. Rilled-ware pottery expands from the west to eastern France (Mordant 2013). The maximum visibility of the western groups occurs ca. 1200–1000 BC with the Rhine-Switzerland-eastern France culture. The practice of cremation is established ca. 1300–1200 BC in the Paris Basin, reaching the Rhine ca. 1150–950 BC. The new period is characterised by cemeteries with highly contracted cists, and burial mounds reserved for important people, usually men, with rich hoards. Characterised by the systematic practice of cremation (‘Urnfields’) but also by fine incised and combed decorated pottery. This culture expands into the Rhône Valley and the Languedoc, where regional developments also continue local influences. The regions bordering the Channel continue the Channel – North Sea cultural complex until the appearance around the 9th century of smaller cultural groups and a more powerful Central France group (Mordant 2013). The initial Chalcolithic period (ca. 2500–2150 BC) shows the use of copper pre-dating the widespread adoption of tin–bronze. This use of copper was already present in northern France a millennium earlier, and its expansion is probably related to the arrival of Bell Beakers, supported by the synchronous appearance of Beaker pottery, stone wristguards, flint barbed and tanged arrowheads, copper daggers and gold basket ornaments. An exemplary sample comes from the Amesbury Archer (Figure 54), probably born in central Europe but buried in southern England with the earliest dated gold and copper objects in Great Britain, although older monuments also show Beaker pottery. Bell Beakers settle in south-west Ireland at least ca. 2400 BC (Roberts 2013). The newcomers encountered the Neolithic custom of building circular or oval monuments of earth, timber, or stone, and pits with internal architectures and avenues in timber and stone emphasising the approach, and wooden palisades excluding external viewers, as exemplified in the Stonehenge monument, which has its parallels in central Europe. Burial mounds or barrows for Beaker burials in Britain, and megalithic wedge-tombs in western and northern Ireland were added to the funerary rites. These displayed striking objects in exotic materials (like gold, amber, and faience) show the influence of the Wessex culture on the whole British Isles. Local differences in burial types show an adaptation to ancient customs (Roberts 2013). Figure 54. Plan of the burial of the Amesbury Archer with the position of the body and the artefacts, after Fitzpatrick (2011), 78, fig. 28. Settlements show mainly short-term oval and circular structures formed by postholes and hearths, with subsistence economy pointing to a prevalence of cattle. This suggests the evolution to a mobile agropastoral economy—with adaptations of the different groups to the local environment—from the previous sedentary arable farming of wheat and barley. Navigation of waterways is evident from the similarity in architecture and artefacts between Britain and Ireland. During the subsequent whole Bronze Age period, the settlement evidence indicates dispersed population living in small communities, usually not larger than a few extended families (Roberts 2013). Marking the transition to the EBA (ca. 2150–1600 BC), changes are seen in the increased circulation of copper in the 22nd and 21st centuries BC, topped by artefacts made of tin–bronzes in significant numbers. Following this, the accumulation of wealth and practice of hoarding begins, with exotic materials for jewellery (like amber, jet, faience and shells) found in increased quantities, and distributed over an ever-expanding area. A gradual population increase is inferred for the whole Bronze Age, compared to the previous period (Heyd 2013). Flint and stone working flourishes at the same time as flint mines show a peak in activity, with ground and chipped axes, edge-ground knives, plano-convex knives and arrowheads, stone-perforated maceheads, axe–hammers, battle–axes, wristguards, whetstones, and moulds for metal objects. Goldworking also expands, as do dressing objects like jet spacer–plate necklaces, disk bead necklaces, V-perforated buttons and belt rings, amber spacer–plate necklaces, and faience beads and pendants. Copper mines of north-west Wales and south-west Ireland begin to be exploited using similar technology, as are tine ores from south-west England, to create the common flat axes, halberds, daggers, and later spears (Roberts 2013). Cremation, which had coexisted with inhumation, becomes prevalent during the EBA. The placing of the dead overlaps with the everyday life, demonstrated by the extensive stone monuments constructed and reworked in Britan and Ireland. Funerary monuments include stone circles, standing stones, and ring–cairns, which are found in distinct layers also including settlements. Hoards include bronze axes and halberds, which reveals a rapid expansion in the scale, diversity, and technique of craftsmanship in metal, ceramics, flint, stone, and exotic materials during the EBA (Roberts 2013). During the MBA (ca. 1500 – 1150 BC), stone, flint, exotic organic and inorganic craftsmanship declines, as evidenced by a reduced quality, although they continue to be widely used. Metal tools, on the other hand, show more quantity and diversity, even though copper ore mining almost stops, which implies recycling and imports from the continent. There is a deliberate separation of copper and gold objects, and deposits can be seen: of shields in rivers and bogs; spears and swords in rivers, river valleys, and along the edges of wetlands; ornaments and tools in hoards in the landscape. Decorated and plain Barrel and Bucket urns become widespread in Britain and Ireland, coexisting with earlier forms and showing regional differences (Roberts 2013). First a custom of building rectilinear field systems appears (especially to the south and east), probably related to intensification of farming economy, substituting previous communal efforts of building monuments, especially in river valleys, coastal lowlands, and the edges of wetlands. These fields needed the digging of ditches, erection of hedges and fences, building of gates, and placing of trackways. Flocks of sheep rather than herds of cattle become common, and the introduction of wells can be seen in agriculture, as well as a change in crop species (Yates 2007). Only later is a widespread construction of circular settlements or roundhouses in timber or stone seen. Concentrations into villages is not common, and a pattern of abandonment and rebuilding of new settlements nearby can be seen, with offerings related to their foundation and abandonment. In England, cremation of the body and burial in flat cemeteries close to settlements is widespread, often accompanied only by pottery. In Ireland, cremation burials with Cordoned Urns continues, as does the construction of burial mounds or barrows until the 1st millennium BC. Nevertheless, deposition of cremated remains accompanied by plain coarse pottery vessels gradually increases (Roberts 2013). The transition from MBA to LBA (ca. 1150 – 800/600 BC) is marked a reduction in upland settlements and an increase in settlements surrounded by banks, ditches, and wooden palisades in prominent places. This is possibly linked to colder temperatures and wetter conditions, in turn related to shortening of the growing season, increased consumption of dairy products (and decreased size and age ranges of sheep), and increased pressure on subsistence. Large accumulations of food consumption, animal management and craft production in middens is seen in southern Britain and south Wales during the early 1st millennium BC, overlapping with the peak intensity of bronze deposition throughout Britain and Ireland, which collapses 800 BC. New types of communal gathering-places emerge, such as middens of southern Britain, timber platforms, and the early hilltop enclosures of the north and west (Brück and Davies 2018). The Rhône culture (ca. 2300/2200 BC) includes the Rhône Valley and part of the Massif Central, with its metallurgy and pottery reaching across eastern and central France and the Rhône corridor. Also included in western Bell Beaker groups are probably the Saône group from the Swiss and French Jura, and the Adlerberg group on the Upper Rhine. Its material culture recalls Late Copper Age assemblages, e.g. from Sion–Petit Chasseur I (of early Bell Beaker groups), including the first metal items such as decorated racket-head pins. Wetlands and lakeshores—offering open space, proximity of woodlands, agricultural soils, and aquatic resources, as well as defence and communication routes—remain the favourite locations for settlements on the Swiss Plateau and in the Alpine foothills. The economy shows innovations such as introduction of new cereals, and a grassland economy with intensified cattle breeding (della Casa 2013). Supra-regional connections are evident from metal resources of the western Alps found in western regions—such as Armorican materials—during the late part of the Early Bronze Age, as well as from EBA Überausstattungen (‘over-endowed graves’) known across the continent, from Únětice to Wessex. Small burial mounds are the most common funerary ritual, but cists, caves, and megalithic monuments remain in use. Grave goods are also evidence of long-distance relations, to the ore-producing zones of the north-eastern Alps (Mordant 2013). During the Middle Bronze Age (from ca. 1550 BC), metallurgy shows an increase in large-scale production, with technical innovations reaching areas like the Seine Valley, the Saône Valley, and the Middle Loire, at the heart of the new trading networks. With the arrival of the Tumulus culture, northern Alpine groups influence the development of local Rhodanian elements. Alpine settlements increase gradually, including sheltered camps and stone-built structures, with seasonal use of Alpine meadows in the context of an agropastoral economy. Possibly since the EBA, mining and production of Alpine copper is an important part of the economy, which increases in importance especially during the LBA and EIA (della Casa 2013). There is abundant evidence for the use of ‘sacred’ natural places for ritual activities and depositions, especially flowing waters, lakes, and ponds, as well as mountain and pass regions. Alpine burnt-offering places are understood as an old, Bronze Age tradition which survives into the Iron Age, with the oldest findings showing calcined domestic animal bones and pottery. Gender subdivision is evident since the Copper Age, with female inhumations showing costume and ornament elements, and male inhumations featuring weapons, mainly daggers, in grave assemblages. Elite graves help support the existence of social structures during the MBA, and spatial clusters probably reflect kinship groups (della Casa 2013). During the LBA, the Rhin-Suisse-France orientale group of the Urnfield culture develops, including the western Alps. Settlements increase in size, with quasi-proto-urban nature and complex structures, including defensive devices. Naturally defended sites such as promontories and hilltops are preferred for settlements in Alpine valleys and Prealps lowlands during the whole Bronze Age. The Inner Alps remained exposed to influences from the south, north and east. Urnfield swords, knives, bracelets, pins, and pottery are commonplace, as well as cremation burials, with regional variations in pottery and bronzes. Vertical social structures are marked by wealth of bronze objects, as well as sets of drinking vessels (della Casa 2013). Most sampled British Neolithic individuals from Scotland, England, and Wales (ca. 3800–2500 BC), before the arrival of East Bell Beakers, form a close cluster, with their ancestry represented by NWAN (ca. 85%) and WHG (ca. 15%), except for three outliers with significantly more WHG ancestry. All Neolithic individuals show I2-M438 subclades, among them fourteen I2a1b-M436 subclades, at least five of them I2a1b1a1a1-L1195 (formed ca. 5100 BC, TMRCA ca. 3600 BC), and thirteen I2a1a2-M423, possibly all I2a1a2a-L161. All British Bell Beakers, whether associated with Maritime or ‘All-Over-Cord’ Beaker pottery, show large amounts of Steppe ancestry, with strong similarities with central European Beaker-associated individuals, especially with those sampled from Oostwoud in the Netherlands, which supports the migration of Bell Beakers from a population close to the lower Rhine (see §viii.7. Germanic peoples). During the initial period (ca. 2450–2000 BC) ancestry proportions were highly variable, consistent with migrant communities just beginning to mix with the indigenous population, either before or after the arrival in the island (Olalde, Brace, et al. 2018). Some samples with minimal British Neolithic ancestry further support a recent origin of the newcomers from continental Europe (Hoole et al. 2018). There is a population turnover of ca. 90% of the local population, with Yamna lineages representing more than 90% of the haplogroups of individuals in Copper and Bronze Age Britain, and new mtDNA haplogroups such as I, R1a, and U4 being previously present among Bell Beakers from central Europe, but not among British Neolithic individuals. This supports the proposed considerable degree of mobility in Britain during this period, with little difference between male and female migration (Parker Pearson et al. 2016), rather than an exchange of female marriage partners (Brodie 2001) or inter-cultural contact consolidation (Vander Linden 2007), as previously proposed for the expansion of the culture. A single source for most British Beakers is also supported by the Y-chromosome bottleneck of R1b1a1b1a1a2c-S461 lineages, whose presence among modern populations along the Atlantic façade possibly supports the original source of British Beakers near the lower Rhine, most likely south of the Rhine–Meuse–Scheldt delta. However, historical interactions of British populations with the Atlantic region may have introduced many of these subclades in the region at a later date. Most further reported subclades from the British Chalcolithic and Bronze Age are R1b1a1b1a1a2c1-L21 (TMRCA ca. 2200 BC), with only three specifically reported as R1b1a1b1a1a2-P312 (xR1b1a1b1a1a2c-S461), and one individual from the Roman period in England showing the rare subclade R1b1a1b1a1a2c1b-DF63 (Martiniano et al. 2016). On the other hand, the investigation of Bell Beakers from Ireland suggests a potentially bimodal migration of East Bell Beaker migrants to the island, from both southern and northern European sources, with south-western individuals showing inflated levels of Neolithic ancestry relative to individualised burials from the north and east (Cassidy 2018). This is compatible with the migration of Bell Beakers from south-eastern France with increased Neolithic ancestry and mainly R1b1a1b1a1a2a-DF27 subclades, probably accompanying the Maritime style, while the rest of the Island would have been populated by migrants from Britain, mainly of R1b1a1b1a1a2c1-L21 lineages and increased Steppe ancestry, as reflected in the Bronze Age samples from the Rathlin Islands (Cassidy et al. 2016) and the reported genetic continuity with modern populations (Gilbert et al. 2017). Increased Steppe ancestry is found in the Netherlands (ca. 60%), similar to some British groups (ca. 31-62%), most likely due to the admixture with Corded Ware groups (see §vii.1. 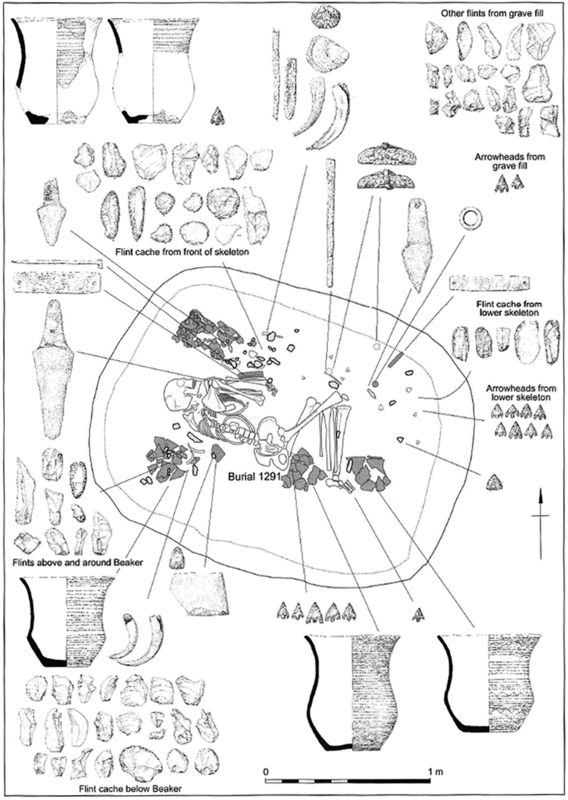 Western and Eastern Uralians), as reflected also in the ‘northern’ shift in the PCA, with British Bell Beakers clustering closer to Corded Ware samples than earlier central European groups. There is higher Steppe ancestry (ca. 50%) from northern mainland sites, with samples from the Haut-Rhin (ca. 2500–2200 BC) and Moselle (ca. 2430–2130 BC), both of hg. R1b1a1b1a1a2-P312. Samples to the west of the Danube, from Sion–Petit Chasseur (ca. 2500–2000 BC), show less Steppe ancestry (ca. 34%), and both reported haplogroups are R1b1a1b-M269, including one R1b1a1b1a-L51. The increased EEF ancestry in southern French and north Iberian samples also support this interpretation of Steppe ancestry acquired in northern groups through admixture (Olalde, Brace, et al. 2018). Samples from England evolve with an increase in Steppe ancestry: from ca. 50% in England and Wales Chalcolithic and England MBA, to ca. 66% in Wales MBA, and ca. 56% in one LBA sample from England. On the other hand, samples from Scotland show a steady decrease, from ca. 54% in the Chalcolithic, to ca. 52% in the MBA, and ca. 46% in the LBA, suggesting different gene flows (or genetic drift) affecting the different groups (Olalde, Brace, et al. 2018). The controversial non-Indo-European substrate of Goidelic (Schrijver 2000, 2005) could be thus speculatively related to the previous intrusion of Megalithic groups, or even to the migration of Bell Beakers from the southern Atlantic façade, of elevated Neolithic ancestry. However, it could also mean the survival of Neolithic vocabulary as substrate of the North-West Indo-European dialects spoken by Bell Beaker groups migrating to Britain and Ireland. Potential Vasconic substrate loanwords in Proto-Celtic (Matasović 2009), some traceable to North-West Indo-European, support their adoption before the arrival of Celts in the British Isles. The few words of likely Indo-European and non-Celtic origin in Pritenic (Rhys 2015), the language of the Picts in Scotland, may reflect the Indo-European dialects brought by peoples of mainly R1b1a1b1a1a2c-S461 lineages across the Channel. Few useful phonetic data can be extracted from the fragmentary evidence, and it seems that the older Pictish inscriptions, dating to ca. AD 3rd–4th centuries (centuries earlier than previously thought), are composed essentially of non-alphabetic symbols, probably in reaction to contacts with Roman and Mediterranean cultures and scripts, and as a public form of display concerned with prestige and high-status identities and activities (Noble, Goldberg, and Hamilton 2018). The peak of R1b1a1b1a1a2a-DF27 lineages among modern populations of the lower Rhine, close to the old Nordwestblock cultural region, may also hypothetically represent this lost Indo-European branch (or branches) of West Bell Beakers, of non-Celtic and non-Germanic nature (Kuhn, Hachmann, and Kossack 1986), although the evidence cited has been contested as Germanic, Celtic, or as of Old European or non-Indo-European substrate (Udolph 1994).